This stunning carpet is woven in pure natural material like wool, cotton and bamboo silk. It is woven in India. Inner Galaxy is a highly durable carpet and 100% hand washable rug. This is a large area rug and ideal for a living room and a bedroom as well. Inner Galaxy is one of the most beautiful modern carpet from modern rug collection of Rugs and Beyond. It is made in handspun wool, Bamboo silk and cotton material. 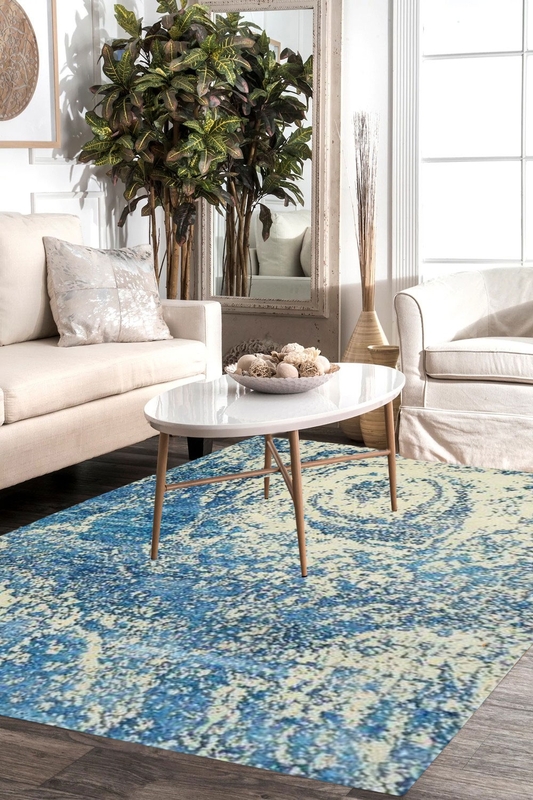 The primary colors are ivory and sky blue and the design of this rug is inspired from universe. Shop this rug online from here at best price. It is ideal for modern home decor and you can use it for a living room, a dining room and a bedroom as well. This is a large size area modern area rug.